I am often amazed to find more alignment with what I consider to be the way of Jesus in “secular” writers and thinkers than in the leaders of the Christian world. David and Goliath by Malcolm Gladwell is a book that demonstrates that the subversive way of Jesus is not a lifestyle that only exists within the Christian community, but a reality that permeates creation. While Mr. Gladwell does not relate his thoughts to the teaching or lifestyle of Jesus, he does begin the book by examining the biblical account of David and Goliath. The subtitle of the book is Underdogs, Misfits, and the Art of Battling Giants. 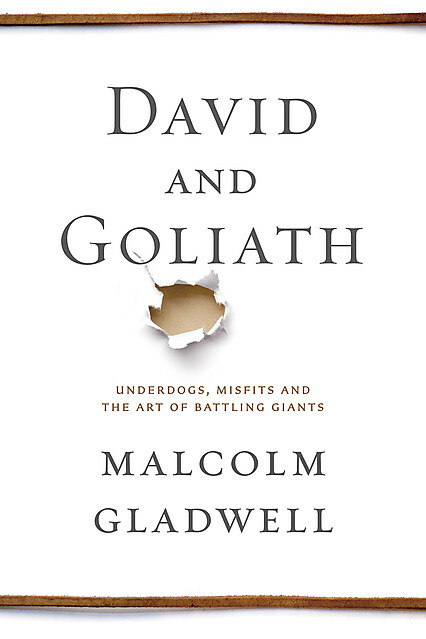 In the story of David and Goliath Gladwell demonstrates that being the underdog is not always what it seems. He shows us that David’s position seemed to be weakness, but it was that weakness that was his advantage. The book gives us story after story of those who have been in positions of weakness – people with leaning disorders, people who have lost family to tragedy, communities oppressed by Nazis – but have become people of great influence. This is not a book about rising above adversity. It is a book about the advantage of adversity and weakness. The book reveals to us that adversity, disadvantage, oppression, and marginalization can often be the position of real power. It also shows us that many of our natural assumptions about power and influence are empty and only lead to dysfunction and destruction. I see these ideas mirroring the teaching of Jesus beautifully. Jesus taught the the poor, the persecuted, those who mourn are blessed. He taught people to give up what they have and not resist the oppressor. He demonstrated that there is power in a life of sacrifice. Gladwell shows us in David and Goliath that the ideas of Jesus are not ones that can be relegated to sentimental religious teachings. He show us that the way of weakness is relevant to the entire world. Malcolm Gladwell’s style of writing is accessible and entertaining. The narrative flows seamlessly between stories, empirical data, and societal observations. David and Goliath is an important book that shows us the ways goodness emerges from weakness.